Over the past years while running this website, we are getting questions about where to stay or do you know any good La Manga hotels ? 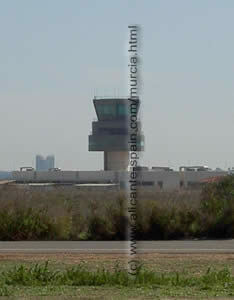 In addition readers sometimes email us about there experience around the Costa Calida and Costa Blanca. So we compiled a kind of a short accommodation list for La Manga del Mar Menor together. Obviously we can not recommend every hotel around the strip (yes that’s what the call the long inbound area of La Manga), but we picked the best ones recommended by web readers. 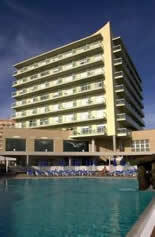 A wonderful hotel in La Manga is the Mangalan . Especially with its Spa facilities and indoor as well as an outdoor rooftop pool. Offers full / half board and all inclusive to fill all your needs. Pictures and review of one of the best La Manga hotels is here..
Great Food and a great view over the La Manga area that’s what you get at the excellent 4 star Las Gaviotas Hotel . A lovely place to be. 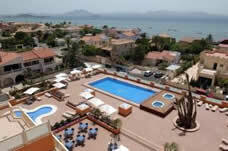 Here is our mini hotel review on this la manga hotel. In case you are looking for a little less expensive alternative, than the La Manga Residencial Apartments would be an option. 56 apartments with a breathtaking view over the bay of La Manga. Photos and overview of the La Manga apartments Residencial are here. ...share your opinion and write a review about your favourite La Manga hotel! I am really sure, our readers whould love to hear about why you liked it so much. It is really easy to do. Just click here and write your story about your favourite hotel in La Manga?